PRINCETON, N.J. -- Six in 10 Americans continue to believe that upper-income Americans pay too little in taxes. 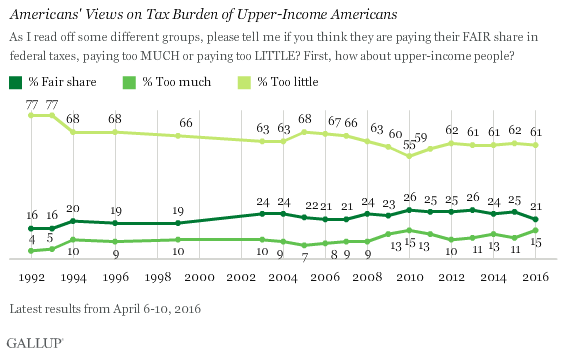 This attitude has been steady over the past five years, but is lower than in the early 1990s, when as many as 77% said those with higher incomes paid too little in taxes. The latest update comes from Gallup's April 6-10 Economy and Personal Finance survey -- conducted during a presidential election year in which taxes have been a major area of focus for the candidates. In particular, Democratic presidential candidate Bernie Sanders has made the reduction of inequality the central motif of his campaign, saying, "The issue of wealth and income inequality is the great moral issue of our time, it is the great economic issue of our time, and it is the great political issue of our time." He has called for "higher income tax rates for the richest Americans." His Democratic opponent, Hillary Clinton, also has called for the need to "reform our tax code so the wealthiest pay their fair share." Republicans, in contrast, have called for simplified tax plans, which will end up reducing the income taxes all Americans pay. Ted Cruz says that under his tax plan, "All income groups will see a double-digit increase in after-tax income." Donald Trump's plan would simplify the tax code into fewer tax brackets. Although it would reduce or eliminate "most deductions and loopholes available to the very rich," the rich likely would pay less in taxes because upper-income taxpayers under Trump's plan would have a lower tax rate. The Democratic presidential candidates are the most in sync with overall public opinion on the issue of taxing the rich, given the significant majority who say upper-income Americans pay too little in taxes. Americans' attitudes on whether upper-income Americans pay too little in taxes are split along political lines. Three-quarters of Democrats say the rich pay too little, compared with less than half of Republicans. Independents mirror the national average. Those with an annual income of at least $75,000 per year, Gallup's highest income category for this analysis, have views that are broadly similar to those earning lower incomes. As I read off some different groups, please tell me if you think they are paying their FAIR share in federal taxes, paying too MUCH or paying too LITTLE? First, how about upper-income people? 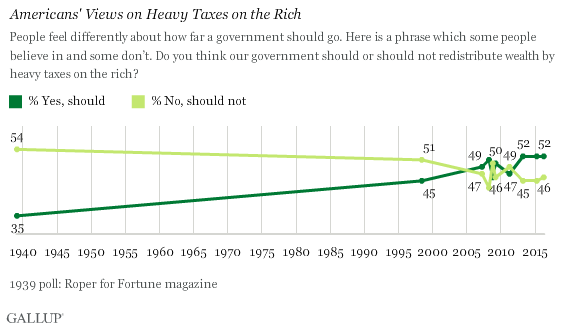 A separate Gallup trend question addressing the issue of taxes paid by the well-to-do finds that a slight majority of Americans agree with the proposition that the government should redistribute wealth by "heavy taxes on the rich." Fortune Magazine first asked this question in the late 1930s, during the Depression, and at that point only about a third agreed. When Gallup updated the question in 1998, 45% agreed. Although the exact figures have fluctuated since, public opinion has been about evenly divided. Most recently, in 2013, 2015 and this year, 52% say the government should redistribute wealth by taxing the rich. Views on heavily taxing the rich to redistribute wealth are strongly related to political orientation, with a huge gap between Republicans (22% of whom agree with the idea) and Democrats (80%), and a similar gap between conservatives and liberals. As household income rises, support for this idea drops, with those making at least $75,000 per year rejecting the idea of heavy taxes on the rich by a 59% to 40% margin. Young people, who tend to skew more Democratic in orientation, are most likely of the age groups o favor the idea. People feel differently about how far a government should go. Here is a phrase which some people believe in and some don't. Do you think our government should or should not redistribute wealth by heavy taxes on the rich? 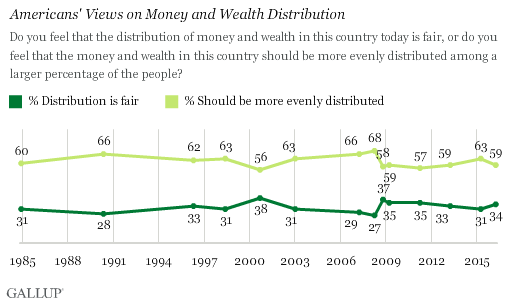 A clear majority of Americans agree that money and wealth in the U.S. should be more evenly distributed among a larger percentage of people, as has been true since Gallup first asked this question in 1984. The percentage agreeing was generally in the 60% range from 1984 through April 2008 and then dropped slightly in the fall of 2008 just before Barack Obama won the presidential election. The current 59% agreement is right at the average of what Gallup has found since 2009. Americans are generally on board -- as they consistently have been in recent decades -- with the concept that wealth and income should be distributed more equally in the U.S. Americans also tend to agree that upper-income Americans pay too little in taxes and that the rich should be more heavily taxed in order to achieve a more even distribution of wealth. These attitudes are divided along partisan lines, with wide gaps in opinion between Republicans and Democrats, reflecting the starkly different positions of the two parties' presidential candidates on this issue. Sanders has been most focused on the issue of income inequality in his campaign, and his position clearly strikes a highly responsive chord with his own partisans, although Democrats interviewed in this survey who support Clinton for their party's nomination are little different on these measures from those who support Sanders. Cruz and Trump may find a similarly responsive chord among their partisans for their "lower all taxes" positions, with again little difference between Republicans who support one or the other for their party's nomination. Overall, the Democrats continue to have a more resonant position than Republicans with the general public on the use of taxes to help redistribute income and wealth. Other Gallup research shows, however, that Americans have become less likely to say the amount they personally pay in taxes is fair, and the Republican candidates' calls for lowering taxes in general may be more in sync with the public's views. Inequality does not show up as an extremely high priority when Americans are asked about campaign issues, and relatively few Americans mention inequality or taxes more generally as the most important problem facing the nation today. Results for this Gallup poll are based on telephone interviews conducted April 6-10, 2016, with a random sample of 1,015 adults, aged 18 and older, living in all 50 U.S. states and the District of Columbia. For results based on the total sample of national adults, the margin of sampling error is ±4 percentage points at the 95% confidence level. All reported margins of sampling error include computed design effects for weighting.